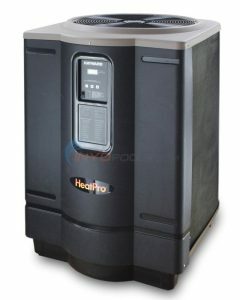 Why would you want to go with a gas heater over just like heat pump? The real difference with gas heat is that you have a rapid heating. It’s not weather dependent at all. You have fuel, you have fire and you get rapid heating. A heat pump would be more like if you were in a maintenance type of heating. If you wanted to maintain your pool at 85 degrees every day, day in day out, you pretty much just set it and forget it and it’ll maintain your pool at that 85 degrees under most climate conditions. As it gets cooler out below 50 degrees, heat pump is not going to give you the heating that you desire. Whereas the gas heater, it’s pretty good down to even into the 30s. Again, it’s that rapid non-weather related heating versus the maintenance heating. On a heat pump you could save about 65 to 70% versus a gas heater in that similar condition. 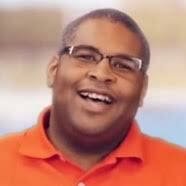 If you’re the kind of person that wants to swim every morning and you want that temperature to be the same every morning when you get in the pool, the heat pump is from an efficiency standpoint and a maintaining of a consistent temperature, the way to go. If you happen to be in a climate though, where you got really cool nighttime temperatures or you do want to swim in the April, October, November maybe in the Northeast, then the gas heater is really the only way to go, because it is not dependent on pulling the heat from the ambient air as the heat pump does. So, you might say a heat pump is more of a Southern state type thing? Bruce: Heat pumps, yes. Sun Belt type of application is really good, because you have the warm temperatures, a little cooler at night and you have– realistically you have lower electrical cost. Somewhere between 10 and 12 cents kilowatt-hour. Again, if you were going to maintain the heat in your pool with a gas heater, the heat pump would be about 65 to 70% lower cost on a monthly basis to do it. So, efficiency. Super quiet. No fuel to bring in, so no natural gas or propane required. You do need a 50 amp circuit, but that’s it. It’s pretty straightforward. Hayward’s main gas heater is called the Universal low NOx. Universal means that pretty much most applications they can be slotted in there, correct? Bruce: Right. What we look at it’s that universal design aspect, so adaptable to the aftermarket as well as for new construction. If you go order an equipment part and it’s got gas line coming in on the right side, electric coming on the left side, plumbing left or right, it’s easily adaptable. You can do left or right, electric, water or gas independently of one another. Some of our competitors, you have to turn the whole unit and as you turn the unit you may get plumbing on one side but then the gas goes to the other side. So, we’re truly universal with independent left and right water, electric, and gas. We have juncture boxes on both sides of our units so you can bring high voltages on one side, low voltage on the other, or you can bring high and low into either side as you see fit. It’s that adaptability that we really push on the universal design. Hayward has the cupro-nickel standard in the Universal low NOx, right? Every gas heater that we manufacture has a cupro-nickel heat exchanger. It’s really a super value statement for our customers. A lot of our competitors charge anywhere from $150 to $250 more for cupro-nickel. We include it in all of ours. 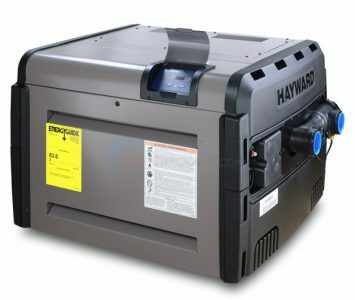 Basically, when you buy a Hayward gas heater, basically you just pick your BTU size and your fuel source, whether it’s natural gas or propane, and everything else is included in the heater. Whether it be a high-altitude, every one of our Universals is good to an altitude of 7,700 feet. If you need to go up to 10,000 there’s an adapter kit, but very, very few are required to go higher. It’s a plate actually that goes on our intake blower. It just changes the airflow and satisfies the need for a higher altitude. Is there a timeline for how often you should clean your pool heater? Not really. Back in the older style of heaters, the atmospheric type of heaters, you could only control the fuel mixture. The draft was just a natural draft, so if you had high or low, the heater would still fire, but it would compensate and you could soot up more, and create situations like that. With all of the Hayward Universal H-Series, it’s a forced draft combustion, so we control the fuel and we control the airflow. By controlling both, you’re really minimizing the amount of sooting that could build up. Really, there’s minimal maintenance. There’s no burn or trace to take out and clean. If you live in an area with a high calcium in the water, you may do something to clean up the heat exchanger from time to time. But other than that, that’s really the value of a low NOx heater. Not only is it low NOx emissions, but it’s really dependable to the standpoint that the heating won’t be interrupted by weather conditions. Whether you have high winds, rain, anything like that, the heater is still going to fire. Whereas atmospheric, if you get a downdraft wind, you could actually get a roll out of the flame through the part of the heater damaging wiring, harnesses, and other components. There are still a few people out there making an atmospheric style of heaters, but I would not recommend those to anyone. Anybody’s who’s making the forced draft control combustion. It’s the way to go. We like to compare the forced draft combustion while you’re controlling the fuel and the air to like a fuel injection, and the old atmospheric style the carbureted engine in a car. There are not so many carbureted car engines out there that you can find on these days. The fuel injection type is the way to go. More efficient, cleaner burning. The DOCs emissions, the low NOx emissions is a nice thing to have. California requires it, but besides that requirement from an environmental perspective is really that uninterrupted heating performance in all kind of weather conditions, and especially that the weather conditions don’t damage a forced draft heater with any kind of a downdraft or flame roll activity. How do your commercial heaters attain certification? This is a commercial application, ASME. To meet the requirement for ASME, you have to have a metallic water path. There are certain pressure tests that are required that a polymer heater would not sustain. What we use on all of our products is a low lead bronze material that we cast. It’s got the same bypass mechanism in it as our residential. That bypass mechanism actually makes us the best hydraulic efficiency of anybody’s gas heater by far in the marketplace. It’s patented design. A lot of people don’t think about hydraulic performance when they think about heaters, but in this case, you get better spa jet performance. 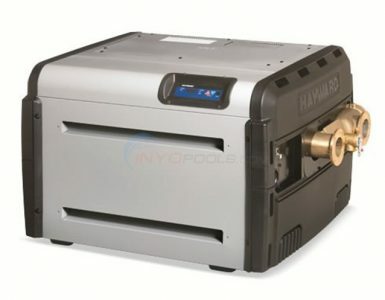 You may not need a blower to support your spa jets since you have the Hayward heater on there. The ASME, it’s really that simple. You need a metallic water path. Cast iron; we don’t use any cast iron. There are competitors that use a cast iron, but they have to line it with glass and as soon as you start putting the sensors in there, you break that internal coating and you’re going to get rust. Hello. I hope you can help. Our pool is staying clean but when the pump shuts off whether timer or manually, it literally sounds like aliens gasping for their last breaths. This has been happening for a few years now. We have a solar heating system. I don’t think this is supposed to happen. It never used to sound like this. And when the solar heater is turned on, water drips off the roof into the gutters & I am having to add water to our pool every few days. Our pool is very large & this is costing alot of $. We recently had it resurfaced so I don’t think that’s the problem. Do you have any suggestions or fixes? The solar panel problem sounds like aa leak, possibly a loose fitting. I’d have the installer come out to have a look-see. If the pump gasping noise only happens after it is turned off, it likely the sound of air entering the season. It could be the solar panels but I don’t think it is because it is on the pressure side of the system, not the suction. have you checked the pump strainer lid, and any plumbing joint seams and valves hairline cracks? Hi, I just replaced the motor on my pool pump but when I turn it on it starts smoking (yikes!) and I can tell the impeller is not turning (like something is getting it stuck). I immediately turned off the pump and power and was able to turn the impeller without a problem but when I try to run the pump the same thing keeps happening. Any ideas? I believe all electrical is hooked up correctly as it is the exact same Hayward motor that was on it before. A common problem with new motor is when the installer does not adjust the voltage knob on the terminal board. If you motor label show “Voltage: 115/230” it means it is a dual voltage more. These dual voltage motors come wired for 230 from the factory. If your old motor ran on 230, you would need to switch the knob to the 115 setting to get the motor to operate. I tried both the 115 and 230 settings. I believe, to your point, that I first tried to run it at 230 volts and fried some of the copper wiring inside the motor. When I switched it back to 115, the motor powered up but I could still tell the impeller wasn’t turning and quickly turned off the power (the motor was hot). Does this mean I need another new motor? To me, it sounds like the motor is shot. But you might want to take it to a motor shop or the place from which you bought it to have them check it. The motor should not have been damaged if it was set to 230, with actual 115 volts applied to it. But the motor would smoke and possibly be terminally damaged if you set the motor to 115 and applied 230.